Typical memory-related problems can be recognized with the help of the "Inspections" feature. Inspections enable automatic high-level analysis of application memory. Each inspection automatically detects a specific memory issue. Performing this type of analysis by hand would be a very complicated (if at all possible) task. With the help of inspections you can easily find the causes and possible solutions of usual memory-related problems. 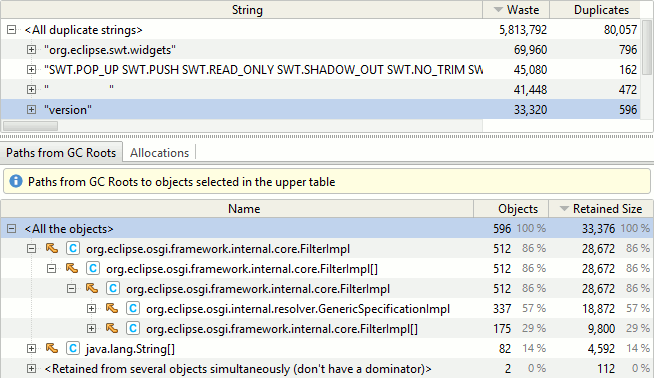 The "Inspections" view is added to any objects view, such as "Memory" or a tab representing a subset of objects. Inspections for all live objects (i.e. for the entire snapshot) are also available via top-level tab "Inspections'. Find all java.lang.String's with identical text values. Problem: Duplicate strings waste memory. Possible solution: Share string instance via pooling or using intern(). Find objects of the same class equal field by field, and arrays equal element by element. Problem: duplicate instances waste memory. Possible solution: reduce the number of instances by sharing, lazily creating, not storing permanently. Find multiple instances of zero-length arrays of particular type. 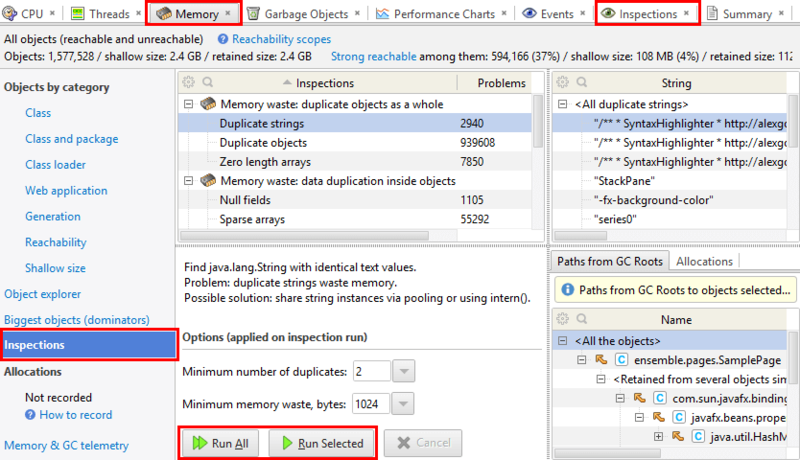 Problem: Memory waste and additional load for garbage collector. Possible solution: Use empty array per-class singleton e.g. via a static field in class. Find instance fields with high percentage of 'null' values. Possible solutions: If some of the fields are not used, get rid of them rarely assigned fields can be moved to subclasses in the class hierarchy. Find arrays with big number of 'null' elements. Possible solution: Use alternate data structures e.g. maps or rework algorithms. Find arrays of primitive types with big number of 0 elements. Find arrays such that all their elements are the same. Find objects retained via synthetic back reference of its inner classes. Problem: Such objects are potential memory leaks. Find SWT control instances not accessible from shown UI. Find HashMaps with non-uniformly distributed hash codes. To achieve good HashMap performance, hash codes of objects used as keys should be uniformly distributed. 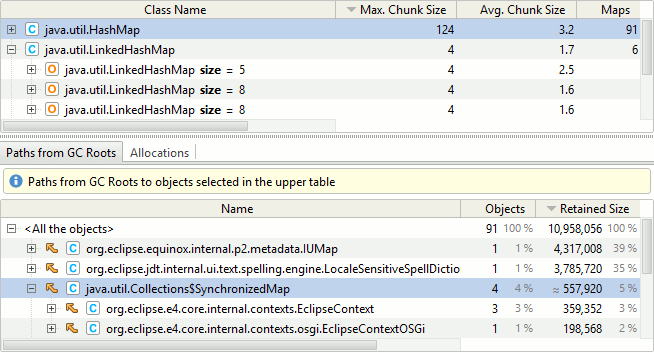 Otherwise, map access performance degrades due to hash collisions. 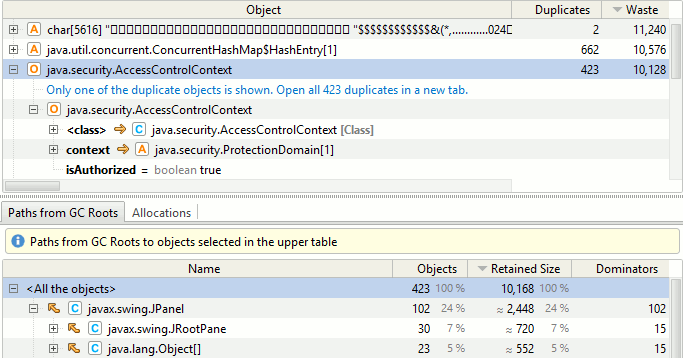 The inspection finds HashMaps with entries most unevenly distributed among chunks. Possible solution: consider better hashCode() implementation for objects used as keys, or use wrappers with properly implemented hashCode(). Find objects referenced by a large number of other objects. Possible problems: Incorrect relations between objects in memory, logical errors and/or non-optimal data structures. Find objects with fields referencing 'this'. Problem: Possibly incorrect logic and/or memory waste. Possible solution: Remove redundant fields. If a class implements interface java.io.Serializable and one of its serialized fields refers to a non-serializable object (directly or through intermediate objects), java.io.NotSerializableException will be thrown in runtime on attempt to serialize an instance of this class. This inspection automatically detects such situations. You can inspect all objects implementing Serializable, selecting Inspections in the Memory tab, or only particular serializable objects. If a serializable class overrides writeObject(ObjectOutputStream) and readObject(ObjectInputStream) methods to change the default serialization behavior, it is impossible to automatically find out what fields will actually be serialized. Thus, the inspection can provide incorrect results for such classes. However, this should not be a big problem, because in most cases this only leads to "false alarms": the inspection would report a referenced non-serializable object which is not actually serialized by writeObject(ObjectOutputStream). This inspection is only available for the profiler's own format snapshots, and is not available for HPROF-format snapshots. The profiler cannot obtain missing data as the HPROF snapshots are produced by a JVM internal dumper which stores only fixed kinds of information. Find objects with longest paths to GC root. Intention: helps finding longest chains of objects such as linked lists, queues, trees etc.